Home / Daily Dose / Where Does America’s Housing Value Stand? Where Does America’s Housing Value Stand? Across the U.S., real estate wealth tends to be unbalanced, landing mainly in large metropolitan areas. In a study from LendingTree, researchers looked at which of these cities hold the highest amount of housing value, using data from LendingTree’s own database. According to the data, New York City is the most valuable city in America, with a total residential real estate value of $2.6 trillion. LendingTree noted that this is close to the GDP of France, and greater still than the GDP of all but six countries: India, United Kingdom, Germany, Japan, China, and the United States. In second place was Los Angeles at a value of $2.2 trillion, which is equivalent to Brazil’s GDP. Another California city, San Francisco, took the third spot with a residential real estate value of $1.3 trillion. These top three cities were the only cities with over a trillion dollars in value, and the report noted that the numbers dropped off quickly after that. According to the Federal Reserve, the total residential real estate value in the U.S. is $28.4 trillion. The top 10 cities in LendingTree’s rankings made up 40 percent of that value, while the top 50 made up half that value. Three of the top ten cities on LendingTree’s list were in California, the only state with more than one city on the list. The other cities in the top ten were Chicago, Illinois; Washington, D.C.; Boston, Massachusetts; Miami, Florida; Seattle, Washington; Dallas, Texas; and San Jose, California. While not in the top three, San Jose takes the tenth spot, but holds the highest median home value on the list at $1,069,000. 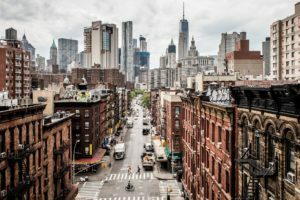 New York City’s median home value is $454,000, still lower than Los Angeles’s $622,000, and lower sill than San Francisco’s $891,000. Find the full story from LendingTree here.